Mobile Device Management, or MDM, is a term that has become dreaded in some circles. It's pretty easy to manage computers that never leave a desk, and still reasonably easy to manage laptops that only leave once in awhile. But when you add phones and tablets to the mix, things can get complicated in a hurry. There are solutions available, but the learning curve can be steep, or require spending a lot of time and effort on IT resources, which is time you may not have. If you are a small/medium business, this is even more unlikely. 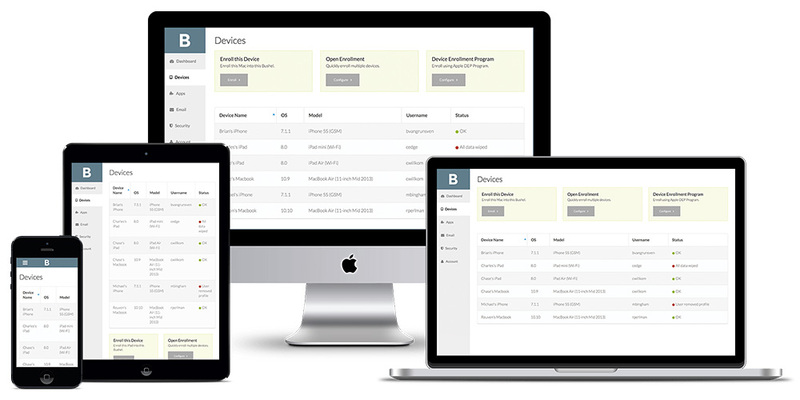 A look at all the hardware you can manage with Bushel. And use to monitor Bushel too! That's where JAMF Software comes in. JAMF has just launched a beta for Bushel, designed to bring MDM to the masses and make it easier for small organizations which might be in need of some sort of MDM solution but the other solutions available might be overkill. I spoke with Product Manager Charles Edge to find out more about Bushel, and he said it grew out of a need to meet the customer where they're at when it comes to IT resources. There are loads of opportunities for mobile technology to make things more convenient in companies of all sizes, but when your IT options are the Wild West or an investment in people and time that may be impossible, there is a good chance the Wild West will prevail. Bushel is aiming to fix that by making MDM something that doesn't require an IT department. This way not only can a smaller organization (which may not even have a dedicated IT group) manage devices, but a single department or group in a larger company can also manage these devices themselves, like an engineering or marketing department trying out new Apple hardware. One nice feature of Bushel is the amount of involvement can be totally adjusted from simply tracking the hardware all the way up to pushing email settings and specified apps. However much control you want, you can have it. Wipe or remotely change the passcode on a lost/stolen device, or even build a phone book by exporting the contact info from all of your enrolled devices. An added bonus is that you can manage Bushel from any of those devices as well, so if you're tasked with MDM and only have an iPad handy at the moment, you can do everything from there. Right now Bushel is invite-only, but you are in luck! Thanks to Charles Edge, TMO readers have an exclusive invitation: Simply head to our invitation page and sign up. Three devices are free forever, and beyond that it's $2 per device per month. There's no long-term commitment, so you can set up and use devices as you like. If you aren't familiar with Apple's Deployment Programs, take a little time to find out how Apple can help with multiple device deployment too. In fact, you can integrate Bushel from the get go: Using Apple's deployment program you can buy devices, ship them directly to employees, and when they walk through setup they'll get enrolled in Bushel as if by magic, and they also get to be the person who unboxes that shiny new device. Check it out!